Alasdair Routh (left) is a Ph.D. student in the Department of Applied Mathematics and Theoretical Physics at the University of Cambridge. 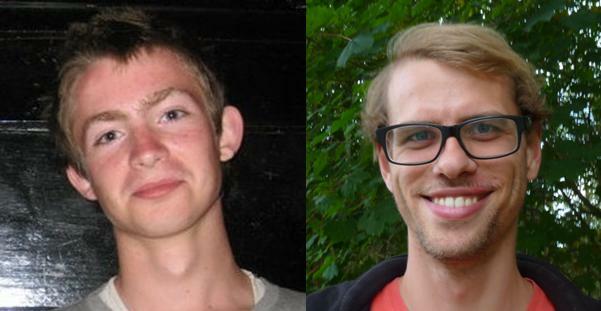 Wout Merbis (right) is a Ph.D. student at the Centre for Theoretical Physics of the University of Groningen. Einstein’s gravitational field equations, which relate the geometry of spacetime to the matter in it, can also be applied to a spacetime of three dimensions (3D) but in this case the matter completely determines the geometry, so there is no “room” for gravitational waves: gravitons in the quantum theory. However, in 3D there is a simple extension of Einstein’s second-order equations to the third-order equations of “Topologically-Massive Gravity” (TMG), which propagates a single massive spin-2 mode; i.e. a massive graviton. In the context of asymptotically anti-de Sitter (AdS) space times, both 3D Einstein gravity and TMG are potentially semi-classical approximations to some consistent 3D quantum gravity theory defined, via the AdS/CFT correspondence, in terms of a 2D conformal field theory (CFT). However, in the TMG case one of the two (left/right) central charges of this CFT can be shown to be negative whenever the bulk AdS graviton has positive energy, and this is inconsistent with quantum unitarity. Various higher-derivative modifications of TMG have been proposed to circumvent this problem but the cost of success has always been the introduction of additional, and unphysical, degrees of freedom. In our recent CQG paper “Minimal Massive 3D Gravity” we solve this problem by introducing an entirely new type of modification of the Einstein field equations. The new equations are not the Euler-Lagrange equations of any action constructed only from the metric. Nevertheless, they are consistent; the particular way in which an inconsistency with the Bianchi identities is avoided is novel and, so far, unique to “Minimal Massive Gravity” (MMG). Remarkably, this particular modification of TMG has no effect on the AdS bulk properties but the central charges of the (putative) dual CFT are now both positive for an appropriate choice of parameters. Thus, MMG is the first viable candidate for the semi-classical limit of a unitary 3D massive gravity model propagating a single graviton. Initially, it seemed impossible to consistently include coupling to matter but this problem has recently been solved; it turns out that the matter source tensor is quadratic in the matter stress tensor. Follow CQG+ by entering your email address in the ‘follow’ box at the foot of this page. Followers of CQG+ enjoy regular updates from the site at a schedule of their choosing and can unsubscribe at any time. This entry was posted in Author Insights, IOPselect and tagged ads/cft, Origin of Classical and Quantum Gravity by BenSheard_Publisher. Bookmark the permalink.